Is this PPP's first push poll ever? I would just say that although the Neumann-Thompson data may be useful, you risk being accused of trying to help Baldwin face a weaker opponent. Also, the GOP should definitely start doing this with Dem primaries between liberals and less-electable ultra-liberals. Trying to emulate and anticipate a campaign season with a twenty-eight word blurb seems like a pretty risky practice. That would likely be the attack, but Thompson wouldn't let it sit without a response. Please don't make a habit of that technique; it's got too much of an odor even if the intentions are good. When I see the lead-in question to your Wisconsin poll, it makes it mighty difficult for me to defend PPP with my conservative-leaning friends, many of whom consider PPP to be a partisan-leaning outfit rather than a straight-arrow, non-biased polling operation. Please don't make my job any harder than it is now! "Lead-in question"? Are you kidding? PPP asked that message-testing question *after* they asked the straight head-to-heads. And people calling it a "push poll" or a "risky practice" don't know much about polling. This practice is called "message testing," and it's very common. 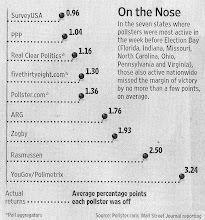 In fact, any campaign that doesn't commission message-testing polls is committing malpractice.